Thank you Kim! Donatello, Forcado, Gitana and Guapo are very happy with their Christmas treats. Merry Christmas!!! Had a great weekend showing at the White Fences Polar Express, perfectly run by Adam Pollak at his beautiful White Fences Equestrian Center. Forcado da Carvalha, 4 y/o lusitano stallion owned by Haras dos Cavaleiros, participated in T-3 both days. Saturday with 67.5% and 2nd place behind the awesome pony Frodo Baggins ridden by my dear friend Audrey Maschue. On Sunday we got 66.818% and a blue ribbon for being the only ones in the class. The improvement that Forcado is showing every time we go out to perform is amazing, and it just makes me drool about his future!!!! Donatello DC, lusitano gelding owned too by Haras dos Cavaleiros, did the new and "improved" 4-2 both days. A bit disappointed on Saturday's performance because he stepped on bad footing while we were waiting for our bell to get in the ring and he was never the same after that. We got 4th place with 60.417% with a few issues. Took care of his body with some ice, liniments, massages and showed Sunday again. Did not risk, just went for a clean test and got 64.583% for 5th place. Very proud of how he's handling the movements for this level at his young 6 years and looking forward to show Prix St. Georges in the near future!!! And decided to bring my dear Top Gun, Dutch Warmblood stallion owned byMary Anne Mcphail, out of show retirement because he's been feeling AWESOME... And AWESOME it was in the ring too We got 68.289% (ridden with snaffle) and 6th place in a class of 18 in Pr. St. Georges!!!! Can't describe how happy and proud I am of this partnership. And a special THANK YOU to Shaana Herlocher Risley for the beautiful pictures!!!! Guapo DC had his surgery today, all went well according to the vets. He was very disoriented in the afternoon and cried a lot in his stall. But settled through the night and had no problems after that. It has become a tradition to officially start the season when Susanne Hamilton arrives from Maine. The meeting point is Backstreets for wings! Stopped at The Tackeria for their Thanksgiving Sale and saw my friend Julia Presnell with the awesome products from La Victoria Performance owned by another great friend, Sylvia Firestone. 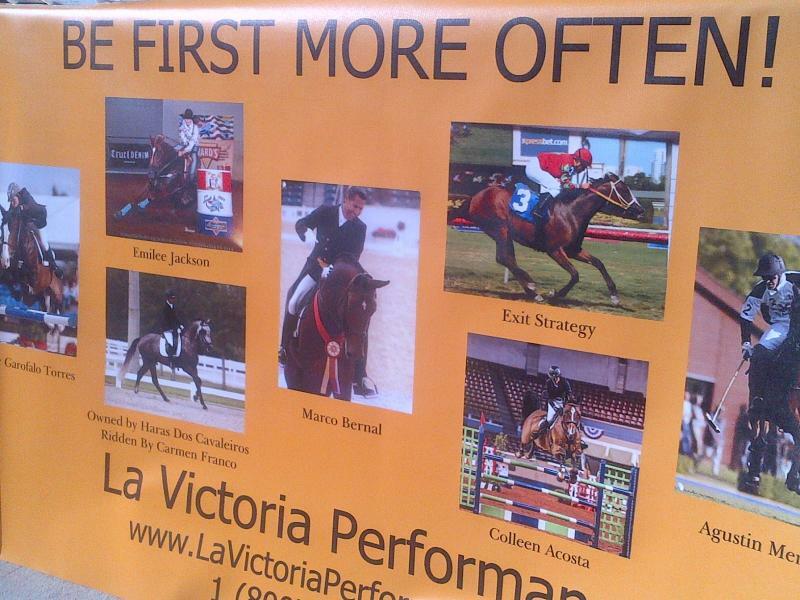 I'm very proud to represent these products, my horses really feel great on them!!! !